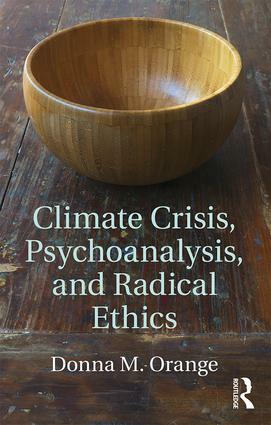 "A significant contribution to the (still too small) psychoanalytic literature on what underlies our disavowal of the serious effects of climate change. Donna Orange's perspective is interdisciplinary (philosophy, relational psychoanalysis and social justice) and her scholarship is deep. I found very powerful her argument that an attitude of exaggerated entitlement - and disavowing the suffering of the poorest that results - is rooted in centuries of colonialism and slavery, This alone made her book for me a ‘must read’, but there is much more, including, for instance, an important in-depth analysis of the role shame plays in supporting the disavowal. "-Sally Weintrobe, practising psychoanalyst, Fellow of the British Psychoanalytical Society, editor of (2012) Engaging with Climate Change: Psychoanalytic and Interdisciplinary Perspectives (Routledge), founding member of the Climate Psychology Alliance.